Here we are at the beginning of a brand new year, so many opportunities lay ahead for us all and we're so excited to see what 2018 will bring us. I haven't written to you since November and you've been busy since then. We got to watch you and Isabella in your Christmas Carol Concert. We were so proud of you both as we watched you singing in your groups, we loved watching you wave at us from across the chapel. 4 years previously, I'd left you with Nainy Colette in London so that I could come home to watch Osh in his Christmas concert. That night I would never have believed that I'd have the opportunity to one day be watching you on stage, especially as Open Heart #3 was booked in as 2nd case the very next day. Christmas seem's to have been and gone so quickly, you really understood it this year. You were counting down the sleeps and were the first to remember about your advent calendar each morning. It was a joy to watch you run into the lounge on Christmas Eve to see what we had put in your Christmas Eve basket. As a nod to our "second home" the Pyjamas we brought you girls were the Peter Pan ones from the GOSH shop. I can only hope that next Christmas is as happy as this one. It's bitterly cold outside at the moment and we're trying desperately to keep you wrapped up and warm. You hate the walk from the car to school in the mornings and the wait in your line to be called in to your class. But at the end of the day when I come to pick you up your hands are always toasty warm. If your hands are already warm you don't understand why you need to wear your gloves, but you'll wear your hat without argument. You're really lucky that hats suit you. You ask every day if you can switch from School dinners to a packed lunch, but I really want you to carry on with School dinners for the winter. Hopefully, by March it will have warmed up a little bit and we can move you. You've already got your Shopkins lunch bag and flask. I just hope that you'll eat your food, you need as many calories as we can get down you. We've been talking for some time about putting bunk beds in your room so that you girls have more floor space for playing. 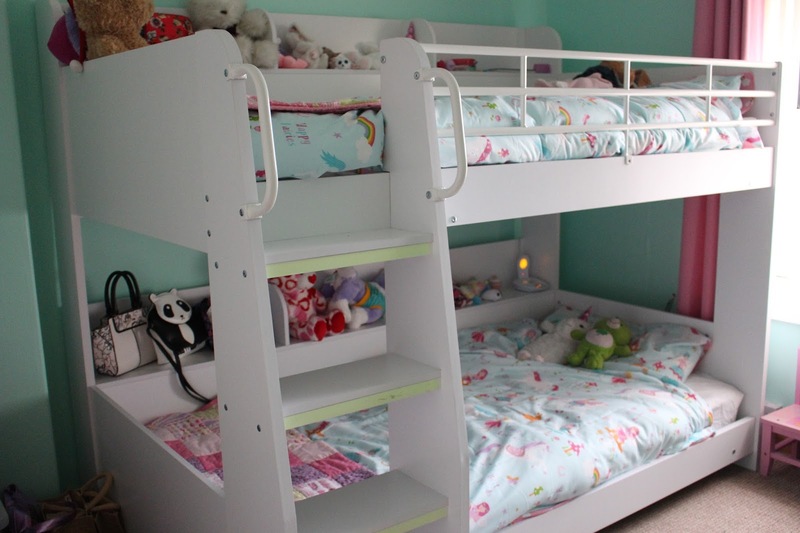 Mammi's bright idea probably wasn't the best one as I chose a lovely bunk bed with three little shelves running along your beds to display your soft toys and handbags...but it's massive. I was hoping to fit a brand new wardrobe in there for your girls, but if I do that - I honestly think you'll have less space than when you each had a single bed. But we live and learn, don't we? Maybe we'll not bother with a wardrobe for a while and just let you girls have the space to play. I've put vinyl stickers on one of the walls in your room in pink, lilac, green, yellow and blue. Daddy came in and said that they look like "hundreds and thousands" but you scoffed "they look like plasters". You're such a straight-talking child. There's no messing around, you just say things as you see them and don't take any prisoners. I hope this is a trait that you'll hang on to for years to come. I still haven't booked you in for your Flu Jab, it's been something I've gone back and forth over since the end of summer. The only year we've given it to you was in 2014 and you had three chest infections that year. But the years we haven't given it to you - you've sailed through winter. So far, the only cold you've caught has been of the snotty nosed variety. I can only hope as we head out of January that I've made the right choice for you. That's what being your Mammi is all about really, I've spent your entire life hoping I've made the right choice for you at each step/ hurdle. We've had almost 5 years with you now so I think we've been doing something right.